Woggs was born to Wogglewood, a loyal Proudfoot of the Vale, and Poggs, a young tradeshalfling of Rivervale. With the untimely death of his mother, and not too long after the tragic death of his father at the hands of the Gnolls of InfectedPaw, young Woggs became very distant from his family and friends and led an almost hermit-like existence in the Misty Thicket. There he met Relia and Faano, two Chosen of Karana, and seeing the potential in young Woggs, bid him see their leader, Reebo Leafsway, in Rivervale to begin a new life as a Chosen of Karana. The solitary and self-sufficient lifestyle of the StormReapers appealed to young Woggs, and he excelled in his druidic training. 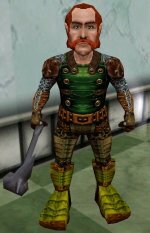 Upon becoming "One with the Wall" and earning his Squad Ring from the Protectors of the Vale, he decided it was time to leave the Misty Thicket and make his way in the wide world of Norrath.